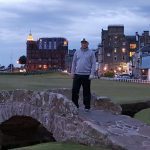 I had an opportunity to visit Trump Turnberry two days before the opening round of the 2016 Open Championship at Royal Troon. We decided to stay, just up the road, at the beautiful Culzean Castle the evening before our afternoon round at Turnberry. After checking in at Culzean Castle we headed to Turnberry for dinner at Restaurant 333. 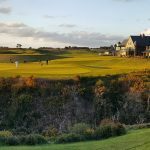 It sits high above the famed Ailsa Course with vast views of the Irish Sea. When it comes to golf hotels Trump Turnberry has some of the most beautiful views in all the United Kingdom. Inside Restaurant 333 you have an incredible panoramic view of the Firth of Clyde, starting with the Ailsa Craig Island, Turnberry Lighthouse, Ailsa Course and ending with the Isle of Arran. 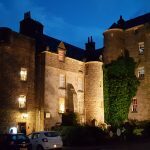 We had a wonderful dinner and then headed back to our room at Culzean Castle. After a few whiskeys in the Eisenhower study, we turned in for the night so we would be rested for our big day at the newly renovated championship course. 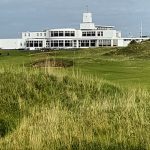 We arrived at Turnberry a few hours prior to our afternoon tee time and had a relaxed lunch at the Dual in the Sun restaurant which is perched above the clubhouse with beautiful views of the historic 18th hole. I highly recommend Dual in the Sun for pre or post dining. After lunch we ventured down to the clubhouse. The staff members were very warm and accommodating to our requests, even allowing us to start more than two hours before our designated tee time. As nice as the clubhouse, locker room facilities and pro-shop are at Turnberry, the hitting range doesn’t live up to expectation and the artificial mats that are available are challenging, to say the least. That being said, the short game practice areas are really nice and there are plenty to choose from. We started our round in near perfect conditions, sunny skies and winds around 15 mph. Perfect conditions for golf in Scotland! We played from the whites but then the winds picked up to a howling 30mph coming off of the Firth of Clyde. It played plenty tough. If you are not getting pushed from behind, I would certainly recommend venturing back to the tips on #9. Even if you don’t hit from back there, it’s fun to at least take a look at how tough the hole would play in a tournament. If you are thirsty or hungry for a quick bite you can head right next door to the Lighthouse Restaurant before tackling the brand new 10th and 11th hole which, after the renovations, are two of the most beautiful holes in all of golf. The renovations at Turnberry are fabulous and worthy of the high marks that have been coming in over the first several months since it’s reopening. When I played Turnberry in June the green fees were £250/275 but in 2017 the cost to play has jumped up to £325/350. It is not cheap but is absolutely worth the money. 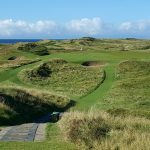 In summary, the much needed renovations at Trump Turnberry, including new bunkering and the dramatic new 9 through 11 stretch, easily puts this legendary links course, on the west coast of Scotland, into one of the top courses in the world.